Media captionSadiq Khan, Mayor of London: "There aren't words to describe the grief and anger our city will be feeling today"
The mayor of London, Sadiq Khan, has dismissed criticism from US President Donald Trump over his response to Saturday's terror attack. The attack in London Bridge and Borough Market killed seven and injured 48. Mr Trump accused Mr Khan of downplaying the attack by telling Londoners there was "no reason to be alarmed". Mr Khan's team said he had "more important things to do than respond to Mr Trump", who had "deliberately" taken his remarks "out of context". "The Mayor is busy working with the police, emergency services and the government to co-ordinate the response to this horrific and cowardly terrorist attack and provide leadership and reassurance to Londoners and visitors to our city," Mr Khan's spokesperson added. On Saturday night, following the attack, Mr Trump tweeted a message of support to the UK, but also sparked controversy after he called for his travel ban on visitors from six predominantly Muslim countries to be upheld by US courts. 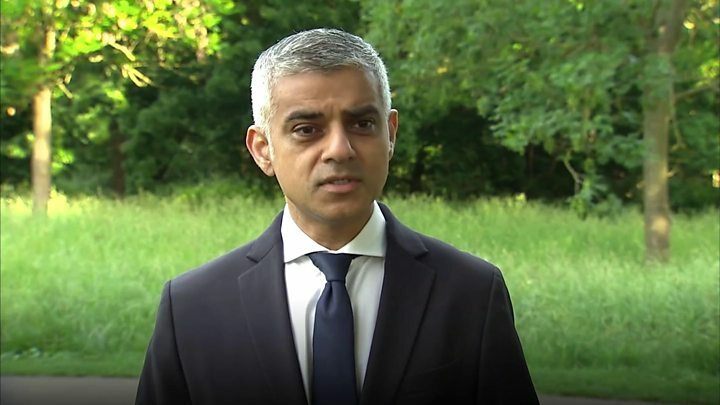 On Sunday, he criticised Mr Khan, writing: "At least 7 dead and 48 wounded in terror attack and Mayor of London says there is 'no reason to be alarmed!'" His tweet angered many in the UK, who pointed out Mr Khan had been referring to increased police numbers on the streets. During an interview earlier on Sunday, Mr Khan had said: "Londoners will see an increased police presence today and over the course of the next few days. No reason to be alarmed." Mr Khan had also said: "One of the things the police and all of us need to do is ensure that we're as safe as we possibly can be. "I'm reassured that we are one of the safest global cities in the world, if not the safest global city in the world, but we always evolve and review ways to make sure we're as safe as we possibly can." Following the attack, Mr Trump also tweeted that "we must stop being politically correct and get down to the business of security for our people", and that there was no gun debate after the attack "because they used knives and a truck". Later on Sunday, Mr Trump visited the Trump National Golf Club in Virginia for the second time over the weekend. Mr Trump and Mr Khan have clashed several times in the past. During the US presidential campaign last year, Mr Trump first proposed the ban on Muslims entering the US, but suggested he could make an exception for Mr Khan, who is London's first Muslim mayor. Mr Khan rejected the offer, saying: "It's not about me, it's about my friends, family and others from all around the world." Mr Khan also accused Mr Trump of being "ignorant" about Islam and making both the US and UK "less safe". Mr Trump responded by challenging Mr Khan to an IQ test, and said he was offended by Mr Khan, adding: "He doesn't know me, never met me... I will remember those statements."